Do you feel your day could be more productive if you had the right plan? Do you sit down to work but you don’t know where to start because everything seems urgent and it all needs your attention right now? Do you struggle each day to find the right starting point? Are you frustrated because you work day after day, but you aren’t reaching your goals and feel you aren’t getting things done? If you answered yes to any of these questions, then the Smart Focus Productivity Planner is for you. The Smart Focus Productivity Planner will help you focus and define your top daily priority so you get more done every day. Stop being overwhelmed with too much to do and not knowing what you should do first. Discover the power of a focused day. Do you have a home project you have been working on for months but it never gets done? One of the reasons we start projects but never finish them is because we feel overwhelmed and don’t know where to start. A few months back, I had a room in my home that had become a total mess. Boxes were stacked floor to ceiling. Every time I walked into this room, I just didn’t know what to do or where to start. I would try to start the clean-up process, but very little ever got done because I would quit because the project overwhelmed me. I finally realized if I was ever going to get this room decluttered and the mess cleared, I needed a better plan. I decided to work on just one part of the room at a time. I focused on putting just the books away. Then I focused on emptying boxes with pictures. Next, I put the china back in the china cabinet. As I worked on just one small part of the mess, little by little the mess started to disappear. After weeks of getting very little done, when I switched to working on just one focused section of the room at a time the whole project was done in a few days. I learned that I could get more done with a singular focus, then when I tried to do many things at once. If you struggle with a lack of focus in your day and constant feelings of overwhelm, then the Smart Focus Productivity Planner is for you. 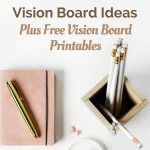 This plan will help you set big goals and dreams, then each day, you will take one step to make one dream or goal happen. Having a laser focus on one goal even if you only make small progress each day is better than no focus on many goals making no progress. As you stay focused on your Daily One Focus task, you will see your goals and tasks big and small finally start to get done. I use the Daily One Focus personally. When I stayed focused on one task daily, I reach my goals and get things done. When we think of productivity, we often think about looking at our long list of “to-do” and getting things checked off. The more we check off, the more we feel like we have gotten something done. Many times a “to-do” list is just busy work not actually helping us reach our true goals and finish important projects. With the Smart Focus Productivity Planer, you will discover the power of a Daily One Focus. When we focus on one primary task each day, we see progress toward a goals day by day and finally reach a goal or finish an important project. The power of the Daily One Focus is that we work on the right project and the right task each day. By working on the right priority each day, we make progress toward reaching our goals. Get your copy of the Smart Focus Productivity Planner and start setting your Daily One Focus, end your overwhelm and get more done every day. With the right focus, what will you accomplish today? This month? This year?